You've imported a script and tagged elements, but now you've received a revised script with new scenes added, or with characters removed. So how do you add additional script pages to an existing breakdown? 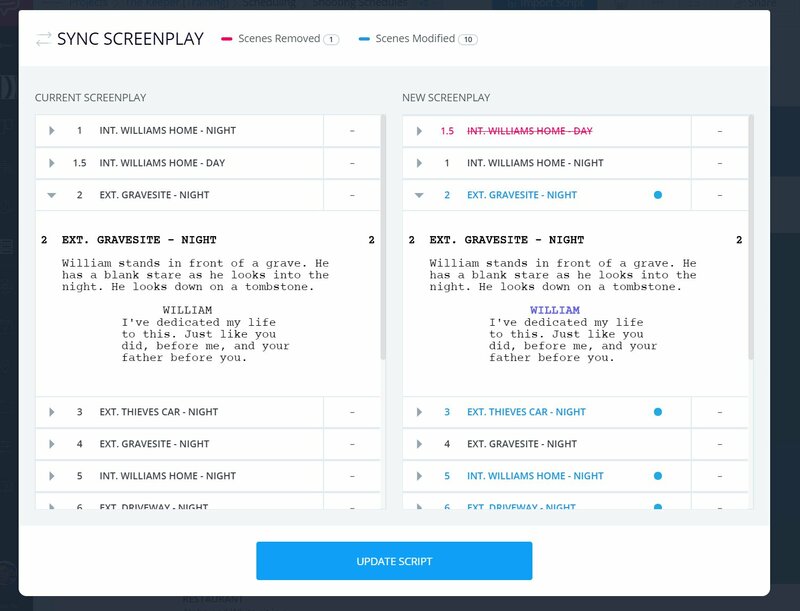 Sync Screenplay makes it easy to work with different drafts so you don't need to start from scratch every time and avoid re-work all over again. For example, if your Assistant Director is marking the props for version 1 of your script, but then you import a new version, you can avoid losing all the tagged elements that's been done already. Say goodbye to re-doing the work by re-importing your script and pick up right where you left off. Why aren't your scenes syncing? When you import your revised script and it replaces all the old scenes with the new one instead of syncing, this could be due to the Scene Numbers not matching. Only some of my scenes synced, why? If only a portion of your screenplay synced, this is most likely due to your Scene Numbers not matching. To avoid having to start all over with tagging elements, it's important to ensure that the Scene Numbers match from your previous screenplay. Can I go back to a previous version of my screenplay? You can always swap back to a previous draft using version history. Can I manually edit a screenplay? Yes, from the Stripboard, click on the scene you want to edit. This opens the Edit Scene Strip window. You can make changes to the script, and the scene heading. If I re-import a script, will my shots be attached to the wrong scenes? When you import a new screenplay with screenplay sync, it will simply add the newly modified scenes to your Shot List, and it will not move shots to other scenes. However, if you added shots to the Imported Scenes List, they will be associated with those specific Lists. This means that if your Scene Numbers changed, those specific shots will be available on the previous Version. In a nutshell, it will not wipe your shot list clean if you re-import, along with any script elements. Is it possible to 'turn off' Screenplay Sync? You sure can! When you import your script, just toggle to 'Don't Maintain Changes' which will treat the import as a fresh script. Keep in mind that this will completely remove stripboard ordering, along with elements that have been tagged in this Version. My shot list is no longer synced with my stripboard after updating the script, is there any way to re-link? The reason that your shots are not appearing any more with the previously associated scenes is due to the Scene Number changing. Revisit your script and ensure that the Scene Numbers are the same, that way, when you sync your screenplay changes, it will maintain your shots as well. Can I sync a PDF script? Yep, this is totally possible! As long as the Scene Numbers are the same, it should sync successfully. How do I add another script to be broken down without replacing the previous one? Simply follow the steps above to sync your script revisions when you import another version of your screenplay. Review the Sync Screenplay Window to verify changes that will take effect when importing a new draft. Removed scenes will show up in red. Modified scenes will be highlighted in blue. You can click on a scene to open it up and see the changes. To avoid formatting errors, make sure you review our Best practices before importing a screenplay article. You can always share a link with Contributors if you need them to view or verify any changes made. Note: A Sync Screenplay window will appear displaying what scenes were removed or modified once a new draft is uploaded. Is there a way to update the script without losing existing breakdowns? That's correct! If you use Sync Screenplay, it will preserve the tagged elements on your account. When syncing a new version of the script, I've lost all tagged elements apart from cast members. This is most likely because the scene numbers in your script have changed. Follow the instructions above (plus the video) and make sure that the scene numbers are the same!